What To Do If You Only Have One Day In Hoi An – Full Itinerary Included! You're in Hoi An only for one day. What should you do? This or that? A or B? Here is our full itinerary for you that covers the most important things at a relaxed pace. Check out the links scattered throughout too for more information! Did that convince you to visit Hoi An? The city is more than just the Ancient Town – it has gorgeous beaches, historical sites, and greenery. So literally, everything you could ask for! Da Nang is only 40 minutes away as well, so how can you not visit? You can easily spend a week there, exploring everything while also having a lazy getaway. Hoi An is downstream of the Thu Bon River in Quang Nam Province. 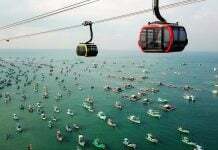 It is about 30 kilometers away from Da Nang city. The city used to be the busiest international trading port in Southeast Asia and is one of Vietnam’s most attractive tourism destinations. It is now a UNESCO protected site and has retained its ancient beauty. 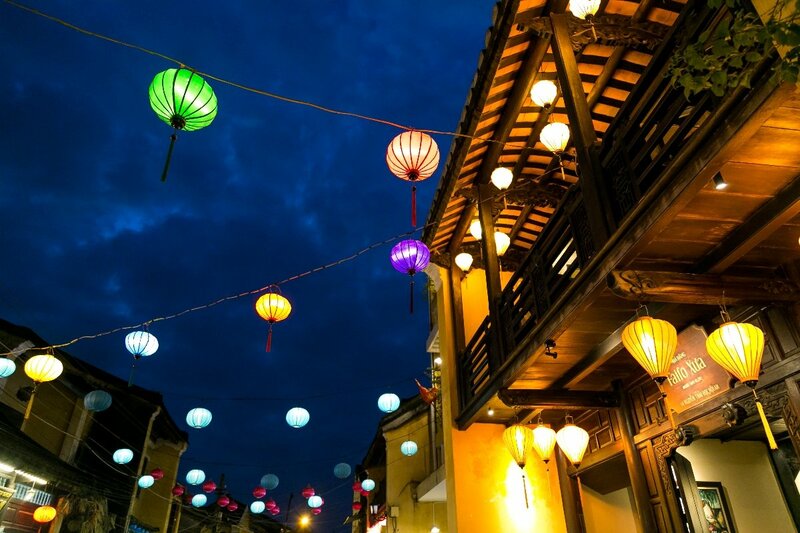 The alleyways light up in traditional lanterns, lined by faded yellow ancient tea houses. The town is really a magical place to explore, especially at night. 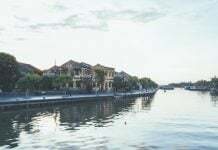 If you wish to fully discover all the hidden charms of Hoi An and its off-the-beaten-track locations, it will take up to a week to explore. Therefore, settling down at a comfy place is a must. Have a look at our Christina’s properties available in Hoi An and see if it fits your needs. However, we know that sometimes you cannot spend more than one day in a place due to limited time or budget. So, we have come up with this itinerary for you, covering everything to do and see even if you only have one day in Hoi An. Pro tip: You should rent a motorbike so you don’t have to rely on taxis and public transport. It’s cheap for a day, just 6 USD approximately and very convenient! Hoi An is famous for colorful lanterns lighting up the alleyways every night, but not many people know the appeal of the town in the morning, especially the beach. If you only have a day in Hoi An, make sure to wake up early because missing the fantastic sunrise here is not an option. In the morning, locals usually go to the beach at 5 AM for swimming or for exercising, it’s a pleasant way to understand local Vietnamese culture as you join the swimmers in the water reflecting the morning light. Besides the popular Cua Dai Beach – which has been depreciating for the past few years, An Bang Beach is on the rise. The beach is listed as one of the “top 50 most beautiful beaches in the world,” just five kilometers from the Old Town. As you witness the spectacle of the sun rising between the islands afar, sitting on the sandy beach with harmonized silver waves touching your toes, you will understand why. After you have enjoyed the cool breeze on the beach, then it’s time to return to the town to observe vendors in their conical hats preparing their street specialties – before the cars and mopeds dominate the road. After wandering around and glimpsing local lives, you will probably feel the need to recharge. 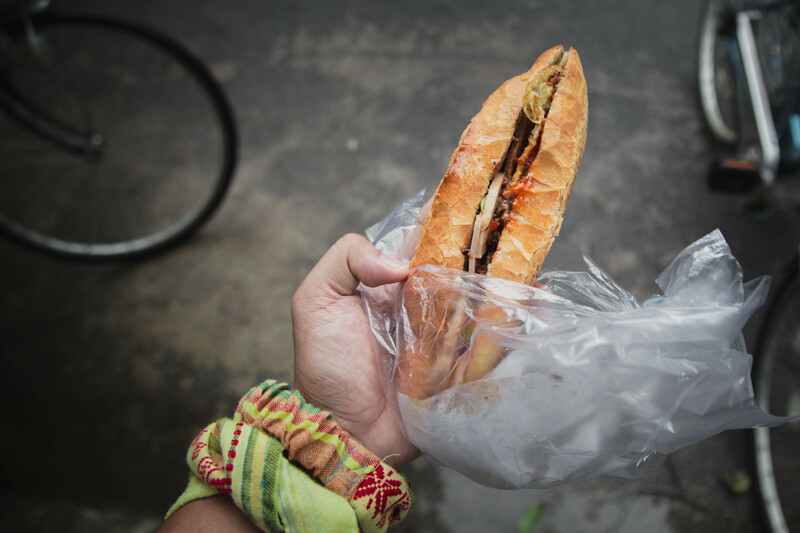 How about a glorious banh mi for breakfast with a plastic cup of local coffee from the streets? “Banh Mi Phuong” at 2B Phan Chu Trinh Phuong or “Banh Mi Madame Khanh” at 135 Tran Cao Van Khanh is a good choice for feeding your morning growl. With only 20,000 VND you will have a delectable baguette full of meat, vegetables, and delicious sauces. To fulfill the morning meal, bring along your banh mi, get a street coffee, and find a random sidewalk cafe next to the Hoai River, listening to sampan engines roaring – the soundtrack of Vietnam. Address: Local food cart, T-junction of Hai Ba Trung st. and Ton Duc Thang st., to the right as you come from the beach. Address: Near Tra Que village, on Hai Ba Trung st. to the left if walking from the beach. It is now time to experience and explore. There are many options that you can choose from while the sun is above, but 2-3 things will feel like enough. Choose from the assortment below and then pick a spot in my recommended list of dishes and restaurants for the perfect place for lunch and dinner. The best thing to do in Hoi An during daylight is wandering around the old town streets, going into some narrow corners and exploring the footprints of time in the old buildings. There are many reasons why UNESCO have listed the old city as a World Heritage site. Traditional buildings reflect a fusion of indigenous and foreign cultures from past centuries. Interesting alleyways and charismatic street vendors provide a maze of memorable moments. 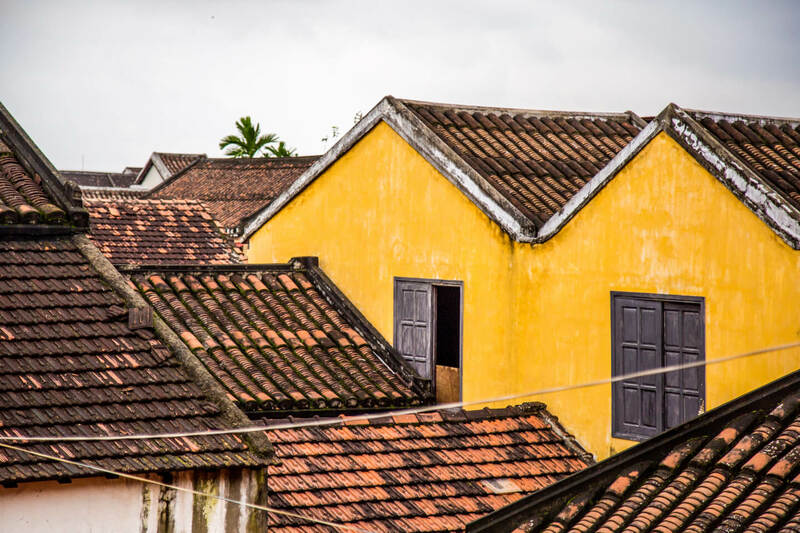 To learn about the life and culture of the locals of Hoi An, you should visit the old landmarks and buildings in the Ancient Town. These include but are not limited to the iconic Japanese Bridge, Sa Huynh Culture Museum, Ethnic Chinese Assembly Halls, and the old houses. However, to visit most of these places, you need to a buy ticket from the official ticket stalls scattered around the Old Town. The easiest ones to find are on Hai Ba Trung street (across Phan Chau Trinh street junction) and on the An Hoi Bridge. 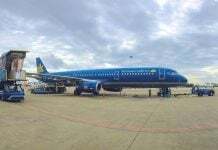 There are two types of tickets: one for 80,000 VND that allows you to visit three places and a 120,000 VND ticket for five places. Also, note that the ticket price proceedings are used to preserve the Ancient Town. 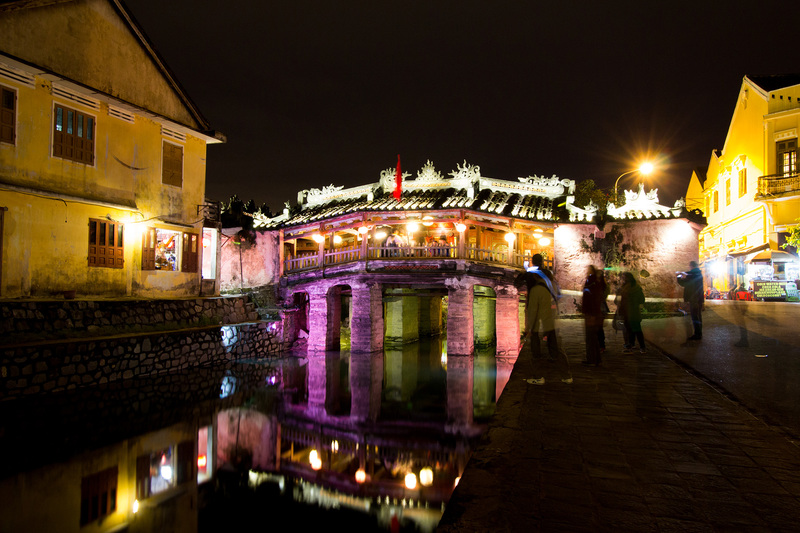 This beautiful little bridge has become a symbol of Hoi An. Constructed in the 1500s by the Japanese community of the time, the bridge retains much of its original design and ornamentation. Inside you’ll find a small temple to the God of Weather. Catch it by night for beautiful photo ops! The reflection of the bridge with the lights on the water is quite magical. Pro tip: Late afternoon is one of the best times to get a picture of the iconic Japanese Wooden Bridge and the best angle to shoot it is from the footbridge. Address: Nguyen Thi Minh Khai St, Cam Pho Ward, Hoi An. Phung Hung Old House is over 230 years old and one of the most famous sites in Hoi An. This two-story building represents a combination of Vietnamese, Japanese, and Chinese architectural styles. Once a trading company for all sorts of exotic cargo, the house is now a workshop for commercial embroidery. Address: 4 Nguyen Thi Minh Khai st, Cam Pho Ward, Hoi An. This museum is for those of you who like some history! Sa Huynh Culture Museum gives insight into the people who dominated this region in the Bronze Age. The exhibits include jewelry, weapons and tools, and relics from funerary rituals, including dozens of huge burial jars. Museum staff can guide you around the museum and labeling to provide more information. Address: 149 Tran Phu, Minh An Ward, Hoi An. Before Hoi An became a fishing town, it was a bustling center for trade. This two-story museum has over 400 exhibits revealing the pivotal role the city played in the pottery and ceramics industry. The building itself is quite beautiful, so get your camera ready! Address: 80 Tran Phu, Minh An Ward, Hoi An. The Cantonese Assembly Hall, Quang Trieu, is large with elaborate, brightly colored sculptures, carvings, and painted scenes. Make sure you pass through to the garden at the back to see the stunning dragon statue. It’s a lovely place to sit and contemplate the meticulous attention to detail throughout the complex. Address: 176 Tran Phu, Minh An Ward, Hoi An. This small temple from the mid-1600s is dedicated to Guan Yu, an esteemed Chinese general in the Three Kingdoms period, who represents the lofty goals of loyalty, sincerity, integrity, and justice. Address: 24 Tran Phu, Minh An Ward, Hoi An. This hall was founded in the late 1600s and served as the assembly hall for the largest Chinese ethnic group. It is Hoi An’s biggest assembly hall. Don’t rush through. The structure is well preserved and restored. Spend some time admiring the ornate and intricate decorations and architectural features. Address: 46 Tran Phu, Minh An Ward, Hoi An. This hall sits right next to the Hokkien site. It was built during the mid-1700s by Chinese immigrants and is dedicated to various deities and people including Thien Hau, Confucius, and, leader of the Chinese revolutionary movement in the 20th Century, Sun Yat-Sen. The Hall has had several uses over the years besides worship. It was a place to discuss business and it also served as a school so children with no clan or community could learn Chinese and keep in touch with their roots. This building is sometimes known as Duong Thuong or Trung Hoa Assembly Hall. Address: 64 Tran Phu, Minh An Ward, Hoi An. While the current house was built in 1850, the family has lived on this site for over 400 years. The house shows exhibits from its time as a successful bookshop, a Chinese herbalist, and the decorated revolutionary past of previous generations. Much of the house is roped off as private because the family still lives here. Address: 129 Tran Phu, Minh An Ward, Hoi An. Quan Thang is one of the most beautiful and best preserved old houses in Hoi An. As you wander through admiring the distinctive Chinese Hoa Ha decorations, architecture, and original furnishings you’ll get a feel of what life of the merchant class was like in bygone eras. Address: 77 Tran Phu, Minh An Ward, Hoi An. This 200-year-old house and chapel gives good insight into the Vietnamese aristocracy, ancestor worship, and clan culture of the Tran Family of Vietnam. Address: 21 Le Loi, Minh An Ward, Hoi An. If you don’t feel like going through the effort of crafting your own tour, especially after having traveled a bunch, then think about booking an adventure. Join Onetrip on their Village Tour and get to know this town like a local. 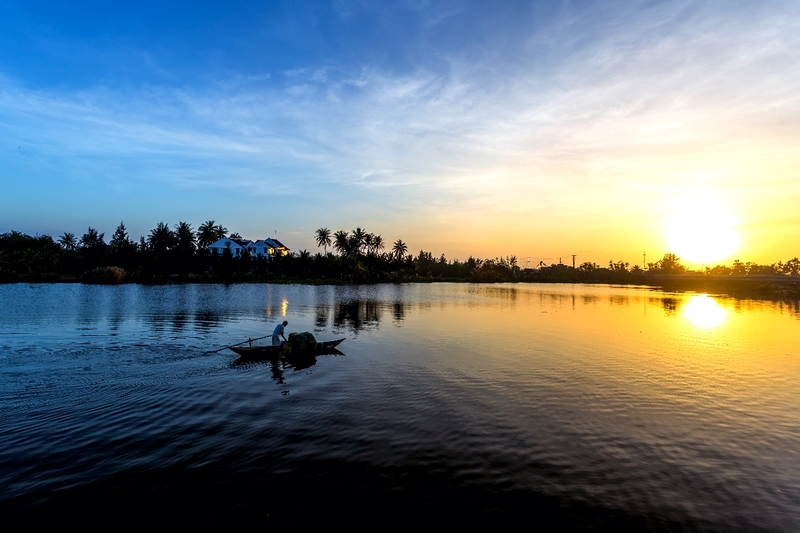 Explore Hoi An’s unique beauty with us and don’t worry about a thing. Cycle around the countryside, paddle along De Vong river, learn about the local lives, and more! If you’re fed up with the busy city life, that’s just one more reason to try this relaxing tour. Hoi An has a slow pace of life and Onetrip just wants to introduce you to its authentic charm. Click here for more info and book a tour if you’re interested! Yes, Hoi An is famous for tailoring. But unfortunately, not all tailors are created equal. Our writers have done the legwork for you and we confidently recommend BEBE as an excellent choice. Can you choose which color among so many options? Address: 11 Hoang Dieu, Son Phong Ward, Hoi An. Bebe has over 15 years’ experience in the tailoring industry and is one of the very few tailors in Hoi An with a dedicated team of tailors on site. They have no less than ten quality controllers overseeing production to ensure perfection in everything they deliver. 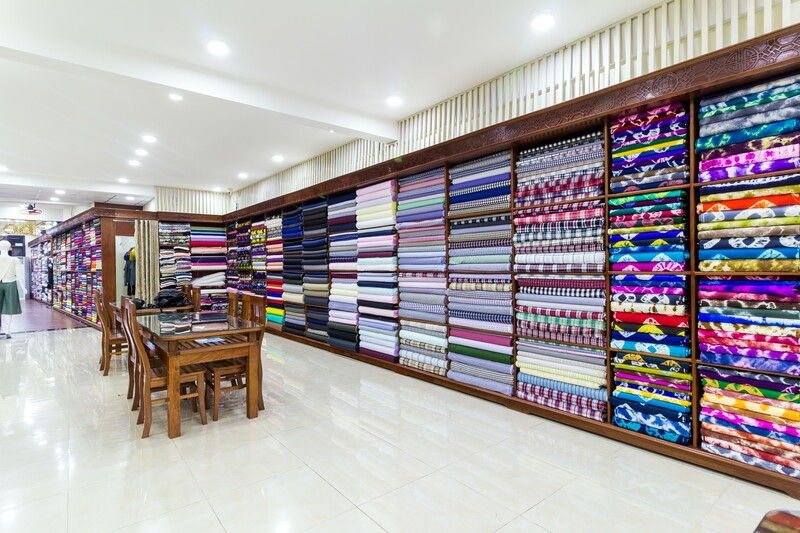 For more in-depth information about tailoring in Hoi An, take a look at this article. 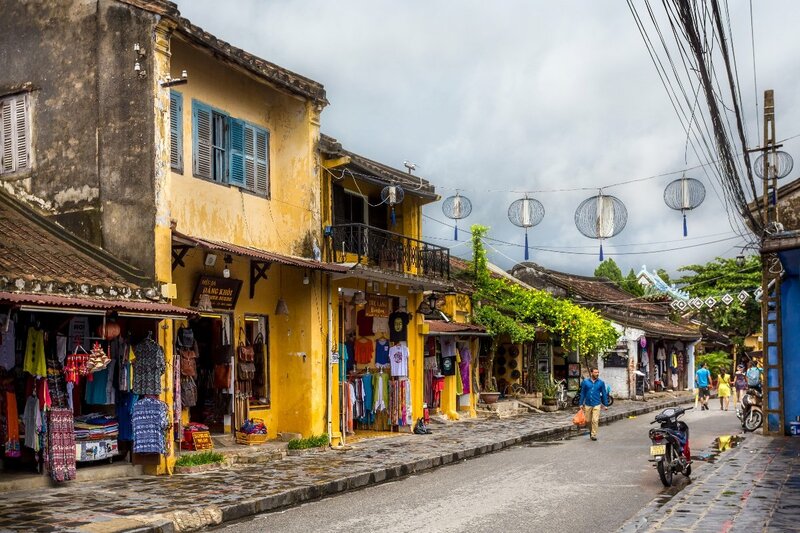 After exploring the old buildings of Hoi An and losing some calories, you can continue to work off lunch by exploring the city’s bustling shopping districts. Visitors can find anything from tailor-made clothing to jewelry. Art galleries, restaurants, and trinket shops are interspersed among the narrow streets. At the center of all this activity is the Hoi An Central Market which provides more than just shopping; it’s an experience. With everything from local food to gorgeous, handcrafted souvenirs, the market has something for everyone— locals and tourists alike. If you’re looking for a more local experience, try Tan An market. The market has row after row of fresh local products and handicrafts. There is also a huge street food section offering an extensive selection of all the local favorites at rock bottom prices. Cao lau, pho, banh xeo, sinh to (fruit smoothies), and lots more. 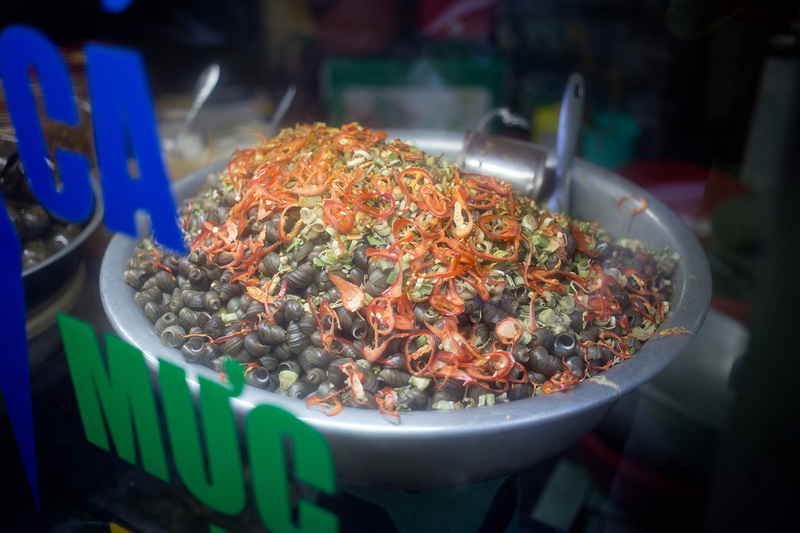 Just approach a vendor that looks busy with the locals and you’ll try something delicious. Address: Tran Quy Cap St, Minh An Ward, Hoi An. Tan An Market is another excellent choice if you want to buy fresh produce to cook for yourself. This market is much closer to Tra Que Village and the beach than Hoi An market, and the prices are somehow cheaper as well. Address: Tran Quy Cap street, Minh An Ward, Hoi An. You can also have a look at Tra Que vegetable garden. Here you will see locals planting and harvesting various vegetables and herbs in vast green fields. Tra Que is located off the main road (Hai Ba Trung) from An Bang beach to the Ancient Town Center. The vegetables harvested here usually go into dishes produced by restaurants and stalls around town. What makes this place special is that there is are no chemicals used in growing the plants in order to guarantee the best quality of vegetables. 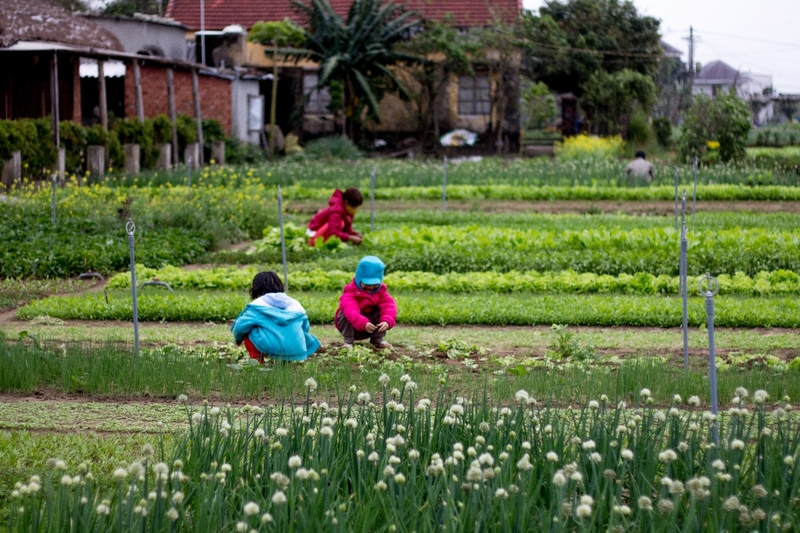 With a short visit to Tra Que, visitors can see firsthand how the farmers grow vegetables in their own ways. Click here for information about the best Tra Que tour. Book the village adventure with Onetrip. What makes this place special is that there is are no chemicals used in growing the plants in order to guarantee the best quality of vegetables. Located in the heart of the famous herb village, Tra Que Water Wheel restaurant is a rustic-designed and restored traditional Vietnamese building. Here you can enjoy the beautiful surroundings while you watch the farmers tend to their produce using organic methods developed over 300 years ago. Tra Que Water Wheel offers you a bicycle tour to the central market. Of course, you will visit the Tra Que vegetable market too. For the cooking class, you will choose between two menus – just choose one that sounds most delicious! You will also learn how to make vegetable flowers and animals. Check out their website for more details about the tour itinerary. If you wish to stay away from all things meat and fish, then the cooking classes offered by Karma Waters Vegan is the way to go. They will show you how to cook authentic vegan Vietnamese dishes, and they also offer classes in vegan international cuisine, such as Indian food. Appetizers, main courses, and even desserts are all organic, vegan, and gluten-free. More information about the courses is provided here. 2 persons or more: 30 USD – 3 courses. This town is also famous for its spas with traditional massages and herbal treatments. There are many spas, so it is difficult for first-timers to pick the right one. I am happy to recommend White Rose Spa for a variety of spa therapies. All therapists are certified and have extensive knowledge of skin care, aromatherapy, and massage techniques. Your biggest challenge will be deciding which package you want. Address: 529 Hai Ba Trung, Son Phong Ward, Hoi An. Check here for more information about the treatments. There are many beautiful coffee shops in Hoi An ancient town which you don’t want to miss. The owners of these coffee shops really pay attention to every little detail to give you a unique experience. If you want some time away from the heat and off her your feet, you should check out the coffee shops in this article! If you’re feeling a little pick-me-up, dive into the Cocobox. It’s a friendly cafe with a passion for organic and local produce, which also sells products from a handpicked selection of local producers. Try their new Cafe Sura Bo, a delectable, creamy milkshake combining Vietnamese robusta coffee, a dash of cinnamon, avocado, fresh milk, and a little condensed milk to top it off. Moreover, their ice cream is divine. Among hundreds of shops selling chicken rice in Hoi An, Com Ga Ba Buoi stands out as a superstar. The business has been around for more than six decades. They carefully cook the glossy yellow rice in chicken broth, then top it with shredded boiled chicken, sliced onions, and herbs as the salad. The shop also has a secret family recipe for their sauces to make a glorious taste you’ll never forget. You may have to wait in line, but in our humble opinion, it’s absolutely worth it. In a hidden alley in the old town, there is a small shop that’s always full of hungry foodies waiting for their plate of fantastic chicken rice. One interesting thing is not many Westerners know this place but it is given the highest rating from the locals according to foody.vn. What you should know is that the shop is quite small and hot, so unless you have your own fan, you will be eating the Vietnamese way. However, the quality of food is really worth a try and the price is also very “local” – only 20,000 VND for a dish of rice chicken. This is also a typical dish of Hoi An that you must try. Cao Lau is a yellow noodle dish mixed with fragrant broth, fish sauce, pork meat, herbs, and some fried croutons. Only costing about 25,000 VND per bowl, Cao Lau is a dish rich in ingredients. To have the delicious golden noodles, we must use the ashes from Cu Lao Cham to soak the rice. The water for the broth must also be taken from Ba Le Well. This well is believed to provide the best quality water. 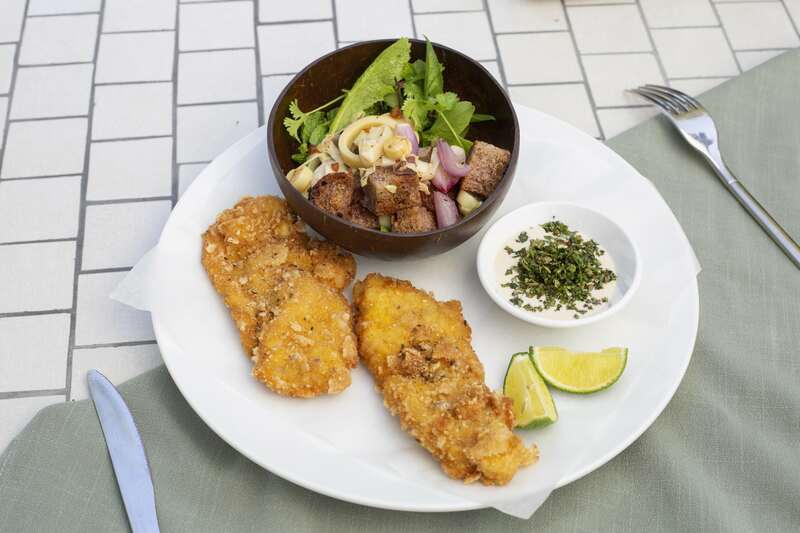 Also, to enhance the flavor of the dish, people often add fried pigskin and dried shrimps. So, where to find the best Cao Lau in Hoi An? For more must-try local dishes in Hoi An apart from these infamous three, you should check this out. Address: 3 Nguyen Hoang, Minh An Ward, Hoi An. The owner, Diem Vy, is the queen of the Hoi An restaurant scene and she also runs other favorites such as Morning Glory and The Cargo Club. The floor layout allows you to see the different foods and watch as the meals are prepared. You can sign up for the all-you-can-eat buffet or order al la carte if you’ve been snacking on street food already. Vy’s has an extensive menu which includes loads of vegetarian options. If you want to be brave, why not try some of the weirder delicacies like Silkworm salad, stuffed snails, or spicy frog’s legs? Address: 106 Nguyen Thai Hoc, Minh An Ward, Hoi An. The Morning Glory Cooking School and Restaurant is the fifth of Ms. Vy’s successful hospitality businesses in the city. The restaurant is the result of Ms. Vy’s passion and vision to create a place where visitors can not only enjoy a gourmet Vietnamese dining experience but also see the food being made first-hand in the open kitchen. The restaurant has a vibrant atmosphere, an awesome menu, excellent service, and the cocktails are delicious. Go there hungry because you’ll want to order it all! Pro tip: In peak season, Morning Glory is often all booked early. Ask your accommodation host to help you make reservations before you head into town to ensure you can get a table at this local favorite. Staying in the “paradise” theme of Tra Que Vegetable Village, this picturesque, open-air restaurant captures the scene, and serves up some of the best home-cooked Vietnamese food in the area. Baby Mustard is found down a dusty path, set amongst vegetable and herb fields. Much of what you’ll eat comes straight from the garden to the table. You can’t get any fresher than that. The restaurant is run by three generations of the same family, who also run one of the best cooking schools in town (not Ms. Vy’s). Address: Duong Bien, Cam Ha Ward, Hoi An. You should take a short taxi ride to Cay Me Restaurant (AKA The Tamarind Tree) in An Bang village to savor some of the best home-cooked Vietnamese food in the region. It is a small family run restaurant that cooks from the heart. They take great pride in serving super fresh produce sourced from the local market, supporting their neighbors and the rest of the community. The menu is diverse enough to appeal to all tastes and they have a good selection of vegetarian options. Address: Cam An Ward, Hoi An. This is the place to go if you want to experience local specialties but you are vegetarian. Affordable, delicious, friendly, and authentic vegetarian regional cuisine await you. The menu is extensive and extremely diverse, and the prices are very reasonable. Address: 50 Tran Cao Van, Son Phong Ward, Hoi An. The peaceful Tra Que Village is also home to Christina’s Hoi An and Joi | Tra Que Gardens. A restaurant that follows the philosophy that “good food comes from good people,” the team at Joi works hard in fostering beautiful relationships with the organic farmers that work right next door in Tra Que. Using only the freshest ingredients, the team have spent time in creating a thoughtful menu that not only encompasses Vietnamese dishes, but a delicious Western fusion mix. Try their baked red rice with lotus seed and pumpkin, or their grilled eggplant dip – both have raving reviews! The location really adds the cherry on top. Situated right by the De Vong river, when you’re dining at Joi, you will experience some of the most peaceful countryside sceneries, occasionally being able to catch a glimpse of a fisherman rowing by. There is also a lagoon in the premises and seats all around it, so go for a walk, take some pictures and let your heart and mind relax. Address: Tra Que Vegetable Village, Cam Ha Ward, Hoi An. Hoi An by night is very calm and magnificent. The whole town will be lit up by a thousand lanterns. The ancient architecture and the nice antique atmosphere will make you feel as if you are getting lost in a fairy tale! It is not a mere coincidence that the Ancient Town of Hoi An was honored as one of the 20 best places to have the best nightlife on the planet. When night falls, this place seems to put on a very glamorous outfit with a mix of the old and new. Things have probably changed over time but there is still a rustic charm of this old town that will capture you and make you want to return time and time again. The Ancient Town is free of motorbikes until 9:00 PM, so take advantage of the town immediately after dinner for a relaxing stroll. Immerse yourself in this magical scene as more than a thousand beautiful lanterns light your way. You can stroll through the lantern-lit alleyways, take a boat down Hoai River and release a floating lantern or two, eat random local food, admire the Japanese bridge, or go shopping in the Night Market. Start from down Bach Dang Street. Almost every canary yellow building within the premise is trimmed with a string of silk lanterns, which are turned on as the sun sets. Head onto An Hoi Bridge, admire the trail of floating lanterns cruising down the now-black waters of the Thu Bon River. Hawkers congregate at the footbridge selling these floating lanterns for 20,000 VND a pop and have devised a clever mechanism of lowering them down into the waters. Even if you are full after dinner, you should make space for the spectacular street food. It is easy to find carts selling all kinds of food everywhere during the night for only 2,000 – 10,000 VND! Major streets, such as Tran Phu, Nguyen Thai Hoc, and Tran Cao Van, are undoubtedly street food paradises. Or how about Hoi An crispy savory pancakes? If you are afraid that you might miss some of these specialties, then there is a solution: Onetrip Hoi An Food adventure! We pick you up at your accommodation, then guide you in and around the Ancient Town, to enjoy many different local dishes and tell you tales about its origin. Our guides are experts in tracking down the best places to get your hands on Central Vietnamese cuisine, and they’re not shy about sharing their secrets with you. With delectable food, interesting stories, incredible location, the Hoi An food tour just might be one of the best food experiences you’ll ever have. Check out our itinerary and contact us if you are interested. Address: An Bang Beach, Hai Ba Trung St., Cam An Ward, Hoi An. Soul Kitchen is on An Bang beach and has a vibrant atmosphere, sea breeze, and whispering waves. Part bar, lounge, and restaurant, the chill vibes make for a relaxed night out. Scope the scene and try to grab one of the coveted cabanas if they are available. They have a diverse line-up of live music performances appearing most weekends and occasionally mid-week. Address: 88 Nguyen Thai Hoc, Minh An Ward, Hoi An. Even if you’re not signing up for a diving course, you can still drop by here for some live music and a few beers. It’s a decent non-backpacker spot and usually attracts an interesting mix of expats and travelers. They have a number of different seating areas, each with its own unique vibe. Address: 94 Nguyen Thai Hoc, Minh An Ward, Hoi An. Q-bar caters to the cool kids in town with stunning lighting, lounge music, and electronica, and possibly the best craft cocktails and mocktails in town. If you feel like a bit of dancing, this is the perfect place. Address: 61A Phan Chau Trinh, Minh An Ward, Hoi An. If you’re missing your sporting fix while holidaying in Hoi An, then this is the place to go. They have multiple TVs showing a range of sporting matches including Premier League, Australian rules football, rugby league, cricket, and American NBL. There’s also free pool and darts. So that is what I can tell you about Hoi An. A day in this city may sound a little busy but it will undoubtedly help you create many memories to reminisce about later. Our advice is to really spend about 3-5 days in Hoi An. This is when you can really grasp what the city is all about. Plus Da Nang nearby has so many sites and beaches to see too – the Marble Mountains, Ba Na Hills, My Son Temples, etc. If you do end up being able to spend more than one day in Hoi An, check out this itinerary: Three Perfect Days in Hoi An. It’s a bit more relaxed and at a slower pace. 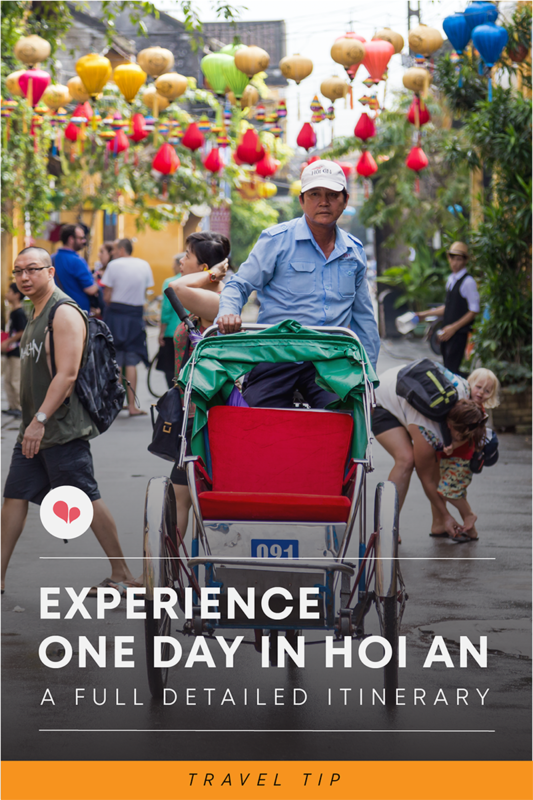 Let us know how your day in Hoi An goes! Enjoyed this article and would like more fun information on what to do, see and eat while in Vietnam? Visit us at The Christina’s Blog!